Email campaigns are a great way to reach potential customers, and are especially effective when used in combination with social media. An email or social message is all it takes to instantly communicate with your customers wherever they are. If you’re already using email to engage your customers, and using MailChimp in particular, then doubling or tripling your reach with social media is just one easy step away. With the MailChimp app for Hootsuite, you can seamlessly manage both your MailChimp and social media campaigns from your Hootsuite dashboard. By developing email and social marketing strategies in tandem, you ensure your business’s message is consistent and on brand. Maximize your email campaign’s reach and easily view campaigns, lists, subscriber profiles, and detailed stats alongside your social networks, all from the Hootsuite dashboard. 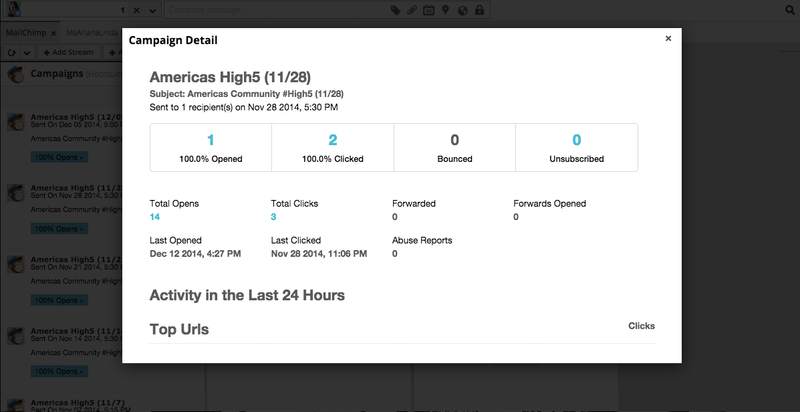 Among the many things you can do with the MailChimp app for Hootsuite, take advantage of being able to track the growth rate on your email campaigns. See how your campaigns are performing and adjust accordingly. 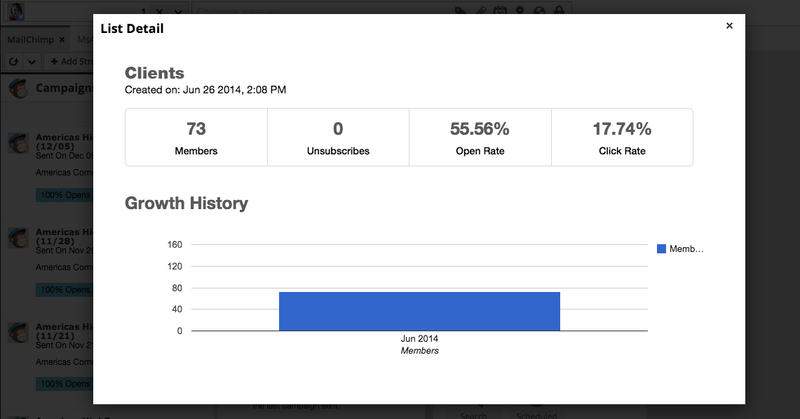 Another way to use the app is to add notes to a subscriber’s profile in MailChimp right from the Hootsuite dashboard. Use this to find subscribers with particular interests, social activity, or ambassadors, and note this in their subscriber profiles for future email campaigns. Download the MailChimp app from the Hootsuite app directory located under the “Free Apps” category. Note: To learn how to add an app to your Hootsuite Dashboard, check out our Add an App in the #Hootsuite Dashboard Hootsuite Tip. 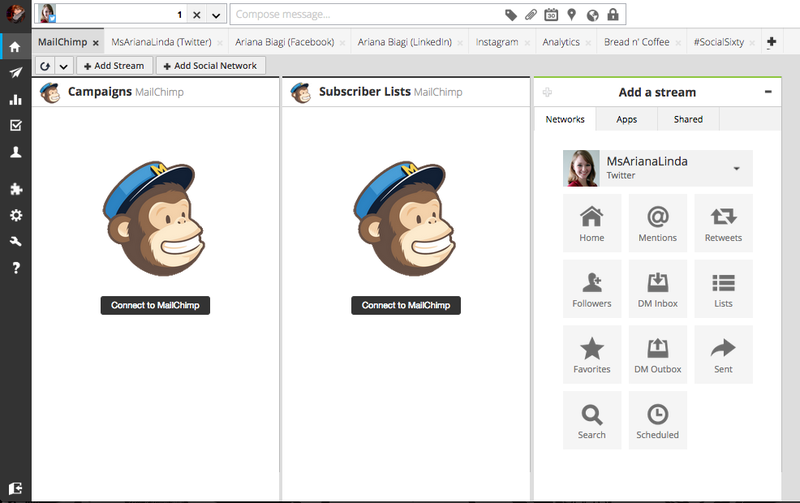 Once installed, two MailChimp streams—”Subscriber Lists” and “Campaigns”—will appear in your Hootsuite Dashboard. Connect to your MailChimp account by clicking “Connect to MailChimp” in each stream and following the prompts. Within the “Subscriber Lists” stream, you can view stats for each Subscriber List. View the current number of Subscribers and number of new and lost subscriptions since the last time a Campaign was sent to that List. To view more detailed information, such as a List’s Open and Click Rates and Growth History, click on the List’s name in the stream. 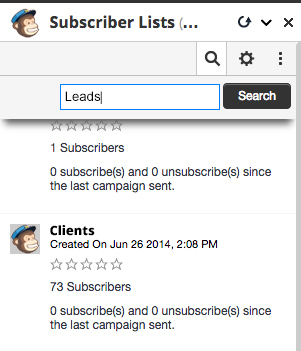 The “Campaigns” stream contains stats for all of your MailChimp Campaigns. Within this stream, you will see the Open Rate for each Campaign. 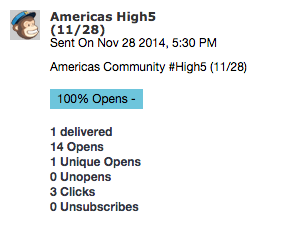 Click the + icon next to the Open Rate to see that Campaign’s number of delivered emails and the total number of resulting Opens, Unique Opens, Unopens, Clicks and Unsubscribes. For more detailed Campaign stats—including Activity in the Last 24 Hours, Top URLs and Top Locations—simply click the Campaign’s title within the “Campaigns” stream. Amplify your Campaign’s reach by sharing it with your social networks. 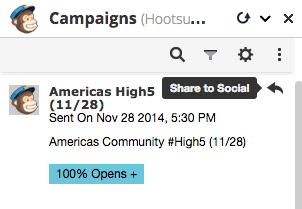 Hover over the Campaign you would like to share and select the Share to Social arrow icon. After selecting the Share to Social icon, the name of your Campaign and an Ow.ly link to your Campaign’s page will automatically be added to your Compose Message Box. From the Profile Picker, select the social networks you would like to share your Campaign with. Click “Send” or schedule or AutoSchedule your message.